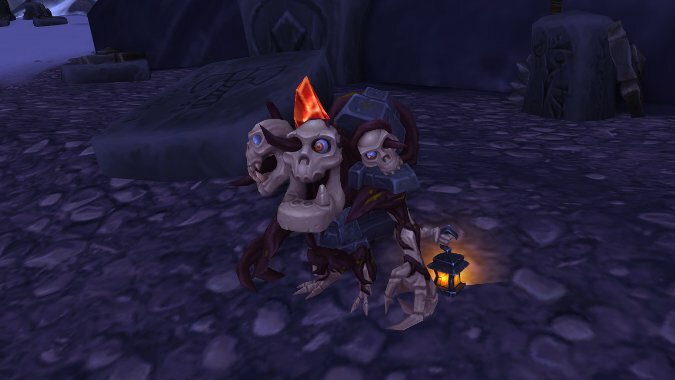 NEXT | We're not sure we can call this tiny abomination "cute"
Some substantial pet battle changes are on the way in the upcoming Legion expansion. Undead pets have long had one of the strongest family abilities in the game. Coming back for one round after death to wreak havoc was something lots of tamers counted on in their strategies. The dev team is working on a nerf to that ability, making that Undead pet deal less damage during their resurrection round. They’re also nerfing a few other things, and all of it involves one pet the devs are also squarely pointing their fingers toward: Graves. This pet, awarded for reaching level 20 in Heroes of The Storm, has been tearing its way through the PVP meta in particular since its introduction. They’re nerfing Graves both directly, by changing its stats and swapping its moves, and indirectly with the change to the Undead family ability. As well as the stat changes, you’ll have to choose between its two strong cleave attacks — they’ll be sharing a slot going forward. There are few other changes to other pets detailed in the blue post by Kaivax, which you can read in full after the break. During its invulnerability round, the active Undead pet will now do -25% damage. Developer note: The Undead racial ability has been one of the most powerful, and this change should help bring it in line with the others. Now has a 1-round cooldown. Dev note: The ability to chain stun opponents (until resilience kicks in) simply feels bad. Rather than a blanket change to resilience, we’re trying a surgical change to one of the more aggravating aspects. Will now have a 5-Round cooldown, to match the other abilities with similar damage and effect. Dev note: AoE abilities are very powerful in the current battle pet metagame, especially “meteor”-type abilities, which are quite effective against both groups of enemies and single targets. This should bring them closer to their intended power level. Dev note: Graves has a bit too easy of a time damaging the entire enemy team. Though we see other setups with Graves, it’s been too easy to AoE, and a bit too powerful among AoE pets. We are wary of opening up additional new Graves combos with this change, and we’ll be testing this closely and reading all of your feedback. Graves’ base stats changed: At level 25, Graves’ Speed will now be 244 (was 211), Power will now be 297 (was 314), and Health will now be 1587 (was 1668). Dev note: Graves’ base stats, along with the Undead racial (which favors slow pets), made him an unfortunate opponent to play against. Combined with high AoE and Consume Corpse, he had very few downsides. This change should help bring his output in-line with other, similar pets.